Outside the States, the new Street is widely regarded as the most important motorcycle in Harley-Davidson’s line-up. 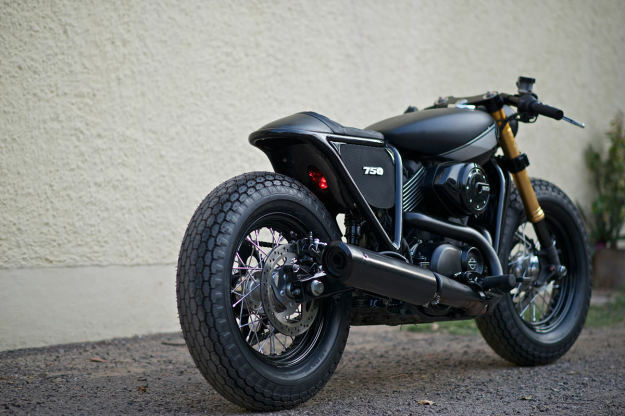 So the bike we’re looking at here is something of An Event: it’s the first officially sanctioned Street custom from an independent builder. That builder is Rajputana Customs of Jaipur City. They’re some 300 kilometers south of Harley’s Haryana factory—where the Street is built—and they’ve done a remarkable job. 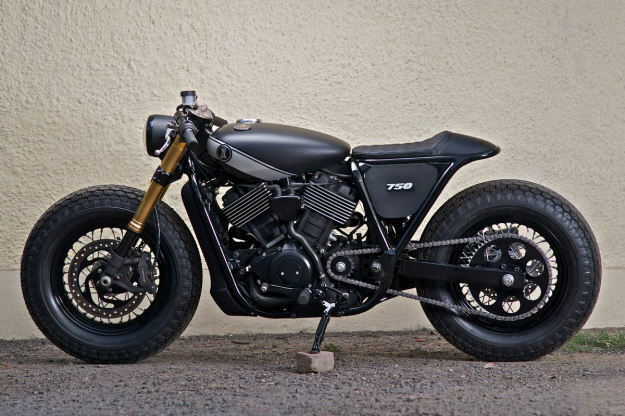 This Street 750 was put together in just four weeks, but you’d never guess. “Given the liquid-cooled engine and snug-fitting chassis, we felt a butch-looking racer was the way to go,” says Rajputana boss Vijay Singh. The first upgrade was the front end, which now sports Suzuki GSX-R forks with 25% stiffer springs. There’s more suspension travel than stock, helped by the removal of the plastic grill surrounding the front-mounted radiator. To flatten the lines of the bike, the standard tank was lifted slightly at the rear and the gas cap moved to the left side. On the right is the speedo, mounted on to the tank itself. 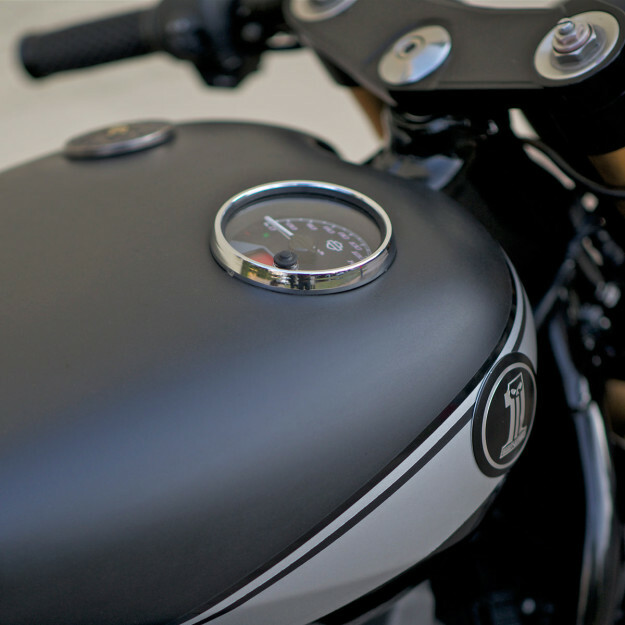 A stripe of grey paint cleverly aligns with the fins of the rear cylinder. The standard dual shocks have gone, replaced by a monoshock mounted to the right-hand side of the swingarm. (“It works like a gem,” says Vijay.) The monoshock also carries the compact battery and part of the wiring loom. The belt drive system of the factory bike is gone, replaced by a chain. Rajputana have custom-machined a front sprocket, and hooked it up to a Drag Race rear sprocket in tough 7075-T6 aluminum from Zipper’s Performance. 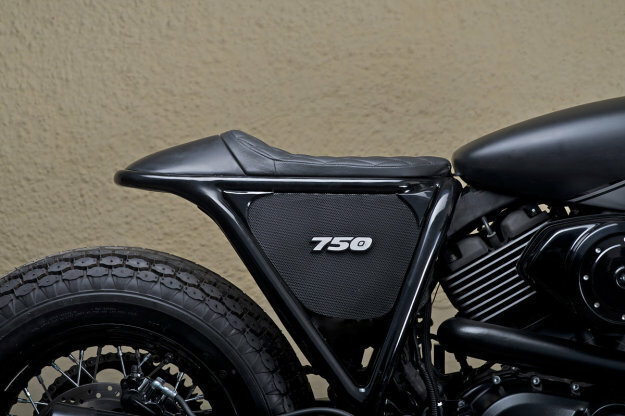 There’s a sleek new subframe and a low profile cowl behind a quilted black leather seat. 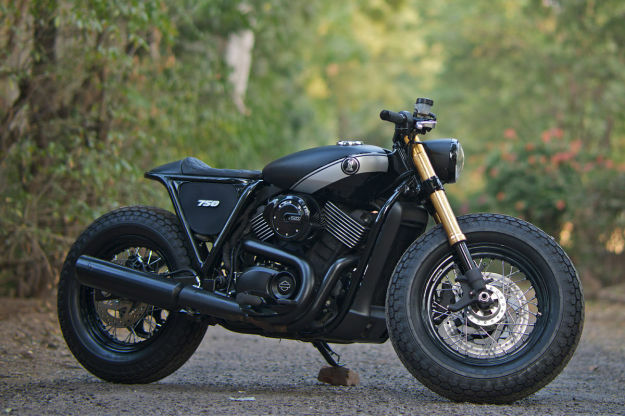 Coker tires are mounted on 16-inch Harley 48 rims and hubs, and the swingarm was modified to accommodate the larger rubber. Custom-fabricated clip-on bars complete the look, topped off with Arlen Ness grips. It’s a quite remarkable transformation—and it’s bound to make a lot of people see the Harley-Davidson Street in a new light. 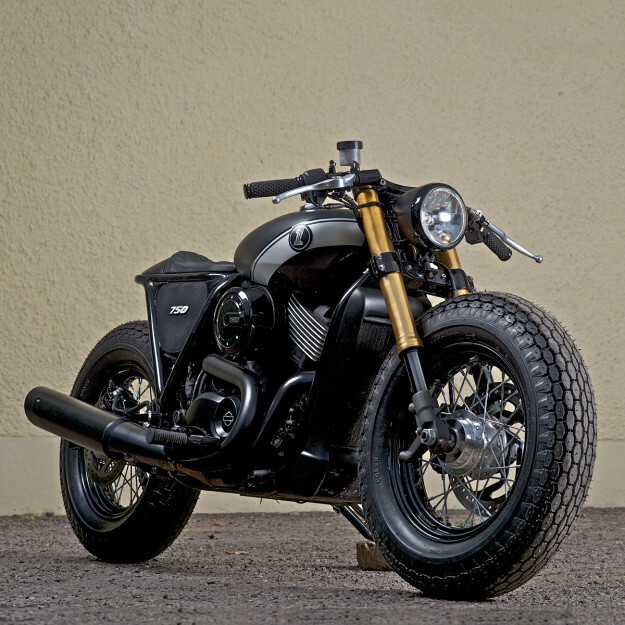 Top marks to Vijay and Rajputana Customs for an exceptionally clever build. A fine bike to round off 2014.